The Best Backyard Summer Games Home | About Us | Opportunities | Sponsorships | Contact Us! Are you ready to kick your summer game up a notch? 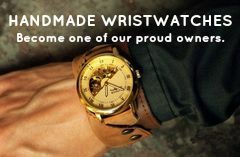 Check out the Handmade Men 2012 backyard summer games guide for 2012! You’ll love how easy these games are to set-up, learn and play – and you, your friends, and your family will have a blast playing them all season long! We’ve chosen our favorite backyard summer games by ease of use, cost, and fun potential. One of our faves! 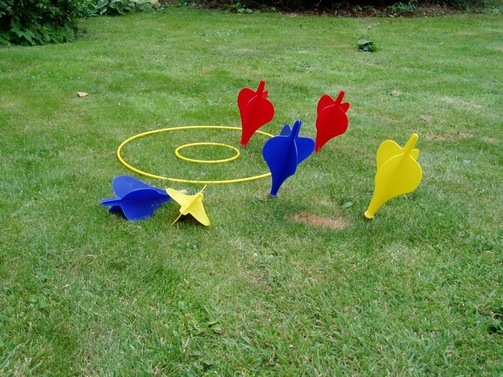 Lawn darts are simple to set up and a blast to play! You simply toss the target out into the lawn, and take turns tossing your over-sized darts with the goal of landing them inside the target ring. 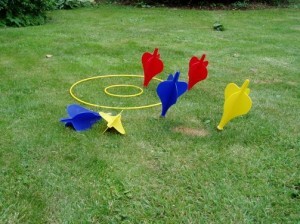 Lawn darts have to pierce the lawn to count – which is a challenge and an easy way to give your lawn some new aeration! The dart tips are perfectly weighted so that the right toss will get you a downward aim towards the target. A perennial favorite, horseshoes has the perfect blend of sport, competition, and laughter! 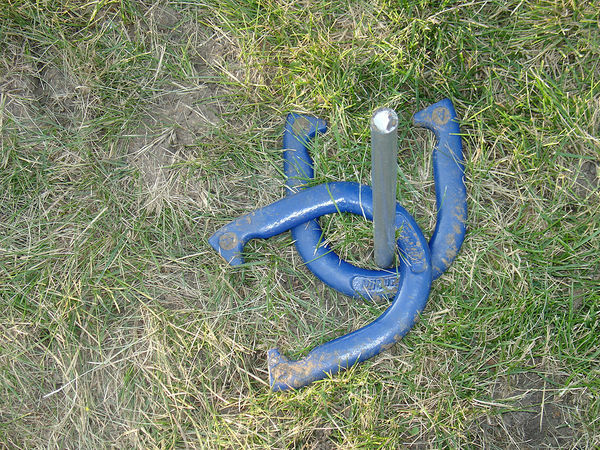 In order to create the perfect horseshoes set-up, you’ll need to plant horseshoe stakes in your lawn. You can do this at the start of every Summer season and then remove them once the good weather takes a rest. To play, everyone stands at an agreed upon distance from the stake and tosses a weighted horseshoe. The goal is to ‘wrap’ your shoe around the stake (see image above for two winning shots). 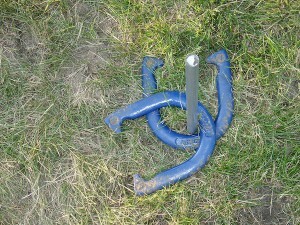 Horseshoes is relaxing, well paced, and simple to play for large or small groups. The perfect BBQ sport! You read it right! 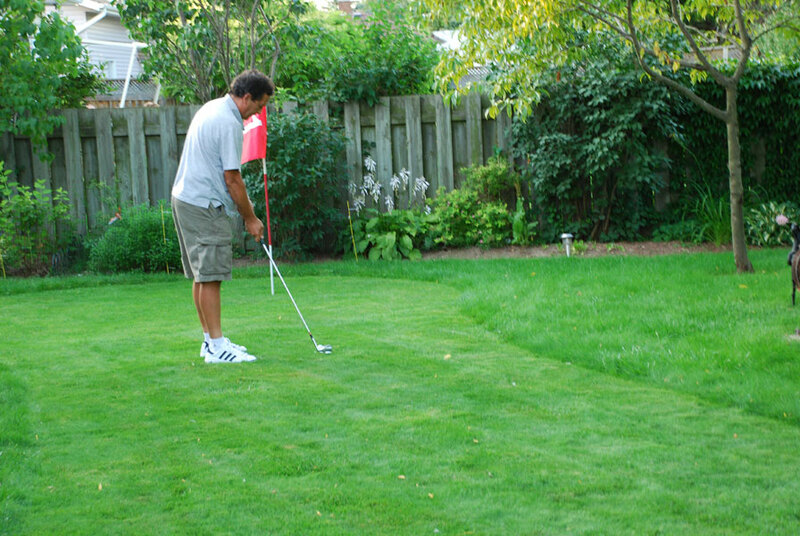 You can play golf in your own backyard this summer season! If you’re planning a party or BBQ, have fun using various settings on your lawnmower to create a variety of grass lengths. Skip the tees and go straight for putting and chipping challenges to keep all of your windows in one piece. You can make up challenges for your guests, or just enjoy some lazy chipping and putting over conversations and great food. Women love the backyard golf setup as well because it creates an interesting texture and pattern in the yard that will really get people talking! No matter what season it is, board games get everyone’s attention! This summer, try taking your favorite games outdoors for a whole new game playing experience! Many games work really well on picnic tables, and the addition of a gentle breeze and BBQ smoke can change the entire feel of even the most traditional game! 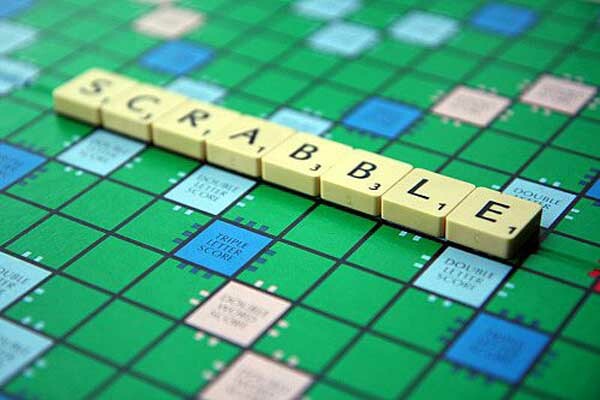 Scrabble, Trivial Pursuit, Pictionary, and Apples To Apples are some of our favorite board games to take outside. No matter what kinds of celebrations, parties, or special events you’re hosting in your own backyard this year (or in the great outdoors! ), make sure you have a selection of games to set the mood and keep everyone smiling. having a few backyard summer games on hand will make sure that your party stays lively and your guests keep coming back for more. Did we miss your favorite backyard summer game? Share it with us in the comments section below! 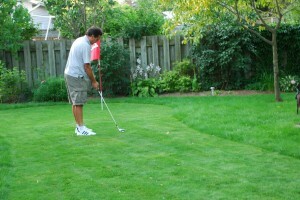 Tagged backyard games, backyard games 2012, backyard golf, croquet, horseshoes, lawn darts, outdoor board games. Bookmark the permalink.